Vox, Six Apart’s new blog service, launched on Oct 26. 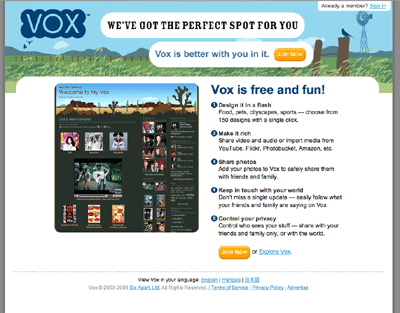 Vox puts the emphasis on personal blogging and sharing with friends and family. It features advanced privacy controls, a stunning variety of unique themes, powerful integration with other services like Flickr, YouTube, and more. 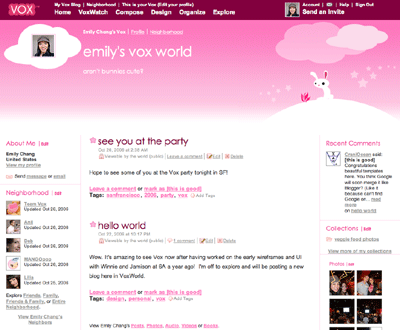 Max and I are pleased to have designed the Bunnylicious and Zen blog themes for Vox. 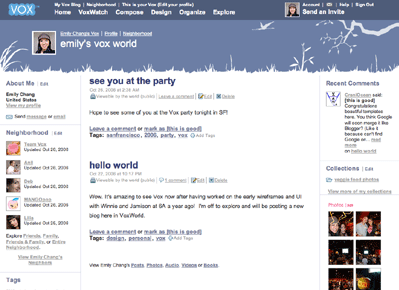 We also loved working with the Six Apart design team on the initial task flow wireframes and UI for Vox (then Comet) during the summer of 2005. I’ve been a fan of Movable Type since it’s first release in 2001 so it’s been particularly gratifying to watch Six Apart grow from Mena and Ben’s idea to a global blogging company with multiple services just five years later.